José Espejo (3L) delivered the second Student Scholars Series lecture of the semester on February 22. 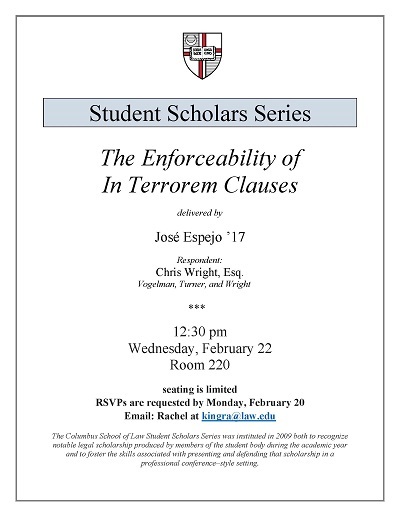 Espejo’s scholarship, “The Enforceability of In Terrorem Clauses,” argued that no-contest clauses, also known as “in terrorem” clauses, which forbids a beneficiary from challenging a will or trust, should be enforced. Espejo, José, "The Enforceability of In Terrorem Clauses" (2017). Student Scholar Series. 26.